Seeking to turn the tables on Pakistan's suspended Chief Justice Iftikhar Chaudhry, the top brass of intelligence agencies today accused him of using their organisations for spying on fellow judges several months before his ouster. "I may be blunt, but I must say that you always leave me in the lurch in the time of trial." He said while addressing lawmakers of the ruling coalition at the Prime Minister House. During his address for nearly 90 minutes, he cited the instances like the U-turn on Afghan policy after 9/11, Dr AQ Khan's detention, the killing of Baloch nationalist leader Akbar Bugti, the judicial crisis or the May 12 killings in Karachi. Saudi Arabia is set to deport 750 more Indians, who were found overstaying in the kingdom on pilgrim visas even as the Indian consulate in Jeddah has set up a special cell to facilitate the repatriation of the persons who overstayed. 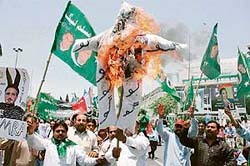 Activists of opposition Alliance for the Restoration of Democracy (ARD) burn an effigy of Pakistan President Pervez Musharraf to protest against a government crackdown on Opposition and media in Lahore on Thursday. Ahead of the G-8 summit in Germany where climate change will be in focus, UN Secretary General Ban Ki-moon has asked world leaders to act with "greater urgency" on the issue as it would have a major impact on the lives of the poor nations. Mostly Republican lawmakers defeated a Democratic bid on Wednesday to outlaw cloning of human babies, concurring with the White House that the effort was flawed and would still permit destruction of life because it would allow embryos to be created for stem-cell research. The government’s concern with regard to the deteriorating human rights situation in the country does not seem to be abating but has taken a turn for the worse with the abduction and killing of two volunteer workers of the Sri Lanka Red Cross Society in Colombo. Sri Lanka's police today began a forced eviction of minority Tamils from the capital as part of a crackdown against Tamil Tiger suspects, officials said today. In a sensational turn to the case regarding Chaudhry, whose suspension caused a national crisis, the jurist was also accused of suggesting to President Pervez Musharraf to dissolve his government and make him the head of an interim regime. Chiefs of the Military Intelligence (MI) and the Intelligence Bureau (IB) as well as Musharraf's Chief of Staff Gen Hamid Javed (retd) charged the judge with frequently interacting with them and freely using their agencies to keep a tab on fellow judges. The officials, in their separate counter-affidavits, were responding to Chaudhry's affidavit before the Supreme Court last month in which he accused Musharraf, Premier Shaukat Aziz and the heads of the intelligence agencies of pressuring him to quit with offers to "accommodate him." In his affidavit, MI Director-General Maj Gen Mian Nadeem Ijaz Ahmad said Chaudhry used to "ask him on a regular basis to provide information on judges in Punjab so (that) he could build a database for his own reference". "I may be blunt, but I must say that you always leave me in the lurch in the time of trial." He said while addressing lawmakers of the ruling coalition at the Prime Minister House. During his address for nearly 90 minutes, he cited the instances like the U-turn on Afghan policy after 9/11, Dr AQ Khan's detention, the killing of Baloch nationalist leader Akbar Bugti, the judicial crisis or the May 12 killings in Karachi. "You never came to my support." Musharraf reminded them that it is a fight for their survival and not his alone. "Rise up, be tough and confront the crisis from the front foot", he said urging them to hold counter rallies and blunt campaign him and the government in the print and electronic media. He justified latest tightening of noose around TV channels. The President said he had "given teeth" to the existing "toothless" Pakistan Electronic Media Regulatory Authority (PEMRA) ordinance. He said the new law is aimed at retaliating to the anti-government media blitz that is increasingly pushing him to the wall with more and more freedom given to it. Musharraf noted that there are about 1,000 provincial/federal ministers, parliamentary secretaries and chairmen standing committees who are enjoying privileges and chided them for keeping silent over current crisis. He said he has not seen even 10 of them speaking in his defence. "Most of them and party leadership remain engaged in gossiping in the comfort of their drawing rooms. I get all the reports and know whatever you are saying and doing. I see the coalition nowhere visible. You people seem to be totally immobilised," he said. In another jibe, Musharraf said: "You are not delivering. You have lost the war of nerves. You all are silent upon what the media is doing. If I have to do everything, then what is your utility?" he asked the treasury MPs. The members, according to one participant, were "stupefied" the way Gen. Musharraf vented his anger at them. There was not much interaction after the long harangue. The few who dared were immediately snubbed. The President reprimanded lady lawmaker, Mehnaz Rafi, who questioned the wisdom of the promulgation of the amended Pemra Ordinance only two days ahead of the National Assembly session. Senator, Javed Shah, who questioned the president's legitimacy saying that Musharraf did not come through the power of ballot, evoked a harsh response. Musharraf said there is no legitimacy problem. The Parliament and other institutions are working. Mazhar Qureshi said the President should not get annoyed with them for not defending him at a time when PML-Q's secretary general Senator Mushahid Hussain Sayed (who was sitting there) was reluctant to speak in his defence. Qureshi said the PML-Q had around 50 vice presidents and not one of them had spoken in the president's favour. About the affidavit filed by the Chief Justice of Pakistan, Musharraf said it has now provided him a chance to tell the public the real story and the actual causes behind showing the door to the top judge. He said the affidavit of those present in the Army House on March 9 would be submitted before the Supreme Court and that he would also address the nation to take the people into confidence. He expressed his frustration in detail and counted each and every incident that had put him in crisis but did not find his political allies around. Earlier this week, Saudi authorities had deported 1,000 Indians for overstaying. Currently there are 350 Indian detainees in the Tarheel Deportation Centre in Jeddah and another 350 at the temporary shelter of Madinat-ul Hujjaj, Indian consul General Ausaf Sayeed said. An unspecified number of Indian illegal migrants, who have converged here from far-off places in the central and eastern provinces of the kingdom, are also taking shelter under various over-bridges in Jeddah, he added. As many as 750 Indian illegal migrants would be shortly deported, Sayeed said. Consulate officials are in regular touch with the Saudi authorities concerned in an effort to ensure speedy repatriation of the Indian Umrah illegal migrants. The Indian consulate in Jeddah has also set up a Special Umrah Overstayers Cell (SUOC) as well as a 24-hour Help Line for the Umra Overstayers. Saudi Arabia recently issued a two-month amnesty for those overstaying their Haj and Umrah visas. The amnesty began on April 2 and ended on June 1. The consulate facilitated the repatriation of over 1,000 illegal Umra overstayers last week. The consulate has been providing the Umrah overstayers interned at the Madinatul Hujjaj with food and water from the Indian Workers Welfare Fund (IWWF) with the assistance of some voluntary organisations and philanthropic individuals. Ban, who was on his way to the Summit, said as the only global forum, the United Nations, is uniquely positioned to forge a common approach to combating climate change. His comments come in the context of fears being expressed that the rich nations might like to settle the issue outside the world body which would deprive the poor nations to have their say. In his message to first session of Global Platform for Disaster Risk Reduction in Geneva, Ban called for renewed commitment to save lives and livelihoods from effects of natural hazards, particularly in the developing nations where the world's poorest live. "And we must act with even greater urgency given the impact of climate change which could result in more extreme weather, rising sea levels and increasingly intense storms and droughts. "This could affect millions of people. Risk reduction is our front-line defence against these threats," said Ban, calling on those present "to act with common purpose" in addressing the problem. "Let's pass a real ban on human cloning, not this phony bill," Republican Rep. Chris Smith of New Jersey said in opposing the legislation in the Democratic-led U.S. House of Representatives. The vote was 204-213 as 31 Democrats joined 182 Republicans in voting against it. A two-thirds majority would have been needed to pass the bill. The White House reaffirmed President George W. Bush's opposition to human cloning. It had threatened to veto the measure, noting the bill would still allow creation of embryos for stem-cell research which requires destruction of human life. "Most of us in this body are opposed to human cloning," said Republican Rep. Joe Barton of Texas, adding if the bill was subjected to hearings a consensus could likely be reached. But Democrats tried to ram it through on the eve of anticipated final congressional approval by the House of a Senate-passed bill to expand federally funded embryonic stem cell research. Bush has threatened to veto this bill too. The House and Senate are not expected to muster the needed two-thirds majorities to override him. Embryonic stem cell research has been the centre of an ethical and political maelstrom and was a hot issue last year when Democrats won control of Congress. Shortly after Bush took office in 2001, he allowed federal funding on 78 stem cell lines then in existence. Most turned out to be of limited use to scientists, who have pressed Congress to expand federally funded research. Virtually all scientists who want to use cloning technology to make human embryos say they do not intend to make babies, but instead to have a source of human embryonic stem cells -- the body's ultimate master cell. They hope to use these cells to better understand and combat debilitating diseases. The defeated House bill would have made it unlawful to use cloning technology to create human babies. Violators would have faced up to 10 years in prison and up to $10 million in fines. "The most effective way to prevent human reproductive cloning in the United States is to pass a federal prohibition," said Rep. Diana DeGette, a Colorado Democrat and a chief sponsor of the measure. Rejecting concerns about the bill's limitations, DeGette said, "The bill bans human reproductive cloning. Nothing more, nothing less." The two men were abducted from the main railway station in Colombo on Friday night by some men who claimed to be from the police, when they were waiting to board a train, to their hometown in eastern Batticaloa district. Their bodies with gunshot wounds were found in Ratnapura, a town more than 100 km south west of Colombo on Saturday. The killings have drawn vast criticism from the UN secretary, Ban Ki-Moon, as well as several foreign governments, including the UK. The incident comes less than a week before the European Parliaments’ Development Committee scheduled to meet on Tuesday, for a two-day meeting to evaluate Sri Lanka’s human rights performance and humanitarian aid provided by the EU since the 2004 tsunami. The committee decisions are not binding on the European Parliament or on the European Commission, but it has the right to submit a report containing draft resolutions to the Parliament for final adoption. Sri Lanka minister of Human rights, Mahinda Samarasinghe, stayed away from the committee meeting saying he was suffering from flu and was advised not to take long distance trip. The country was represented by its Ambassador to Austria, Aruni Wijewardena. The move seems to be a deliberate one on the part of the government which is angry that independent human rights groups have been given the opportunity to make representations at the committee. The government says the killings show that it was done to discredit the government. President Mahinda Rajapakse has ordered a probe into the killings and if it does not yield results, he would take assistance of International police agencies. As international pressure grows, Japanese special envoy to Sri Lanka, Yashushi Akashi arrived on Tuesday, his 14th visit to the island to kick start the stalled peace process between the Tamil Tigers and the government. International pressure does not seem make either the government nor the LTTE back down from their tough stance that is pushing the country towards more blood letting. Tamil men, women and children, who had taken shelter at low-budget hostels were forced out of their rooms, ordered into buses and driven off under armed escorts, residents said. The move followed an announcement by police Inspector general Victor Perera last week that Tamils “loitering” in Colombo were a threat to the national security and that they would transported back to their villages. The government has blamed Tamil Tiger rebels for the bomb attacks in and around the capital last week. The National Parliament was in uproar over the forced eviction of Tamils with ethnic Tamil MPs disrupting the proceedings to protest against the police action, officials said. The government has also tightened restrictions on Tamils leaving the north-east and travelling to the rest of the country. From today, authorities would not allow any heavy vehicles to travel out of the northern and eastern regions to the rest of the country in a bid to prevent bomb attacks, a police official said.